I haven’t shared much about my girls in a while! I couldn’t help but snap this photo—it’s rare to see them smoosh themselves together and sit like that for any period of time! I swear that Sybil (the calico on the right) just wants to be besties with Rosie because she loves sitting close to Rosie and if Rosie is getting attention, Sybil wants attention, too. Rosie doesn’t really want anything to do with Sybil, though. Haha. It always surprises and excites me when Rosie is willing to let Sybil get close to her. My heart! Not much has changed in their world. I’m saving money for a dental for Rosie, which may require a echocardiogram first because her vet hears a heart murmur (she’s heard a murmur since the first time I took her in, and I had an echo done a few years ago but they want to check again…). Both of those will cost a pretty penny. I’ve been managing Sybil’s tendency to develop crystals in her urine due to stress by feeding her a little bit of urinary prescription food every day (and of course, trying to minimize stress, which tends to pop up when we travel/leave the house for a while). We also grabbed a bite to eat at a restaurant situated right at the top of the canyon on the west side of Twin (left photo above). 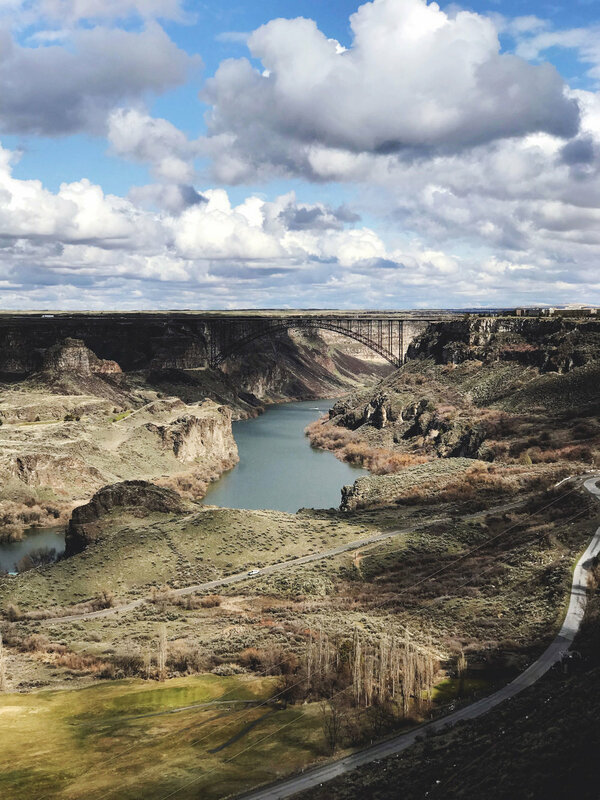 We had an amazing view of the Snake River and of the Perrine Bridge, which carries the main road going into Twin Falls from the interstate. It’s well-known in the base jumping world but that’s not something I ever plan on doing! The bridge, which was completed in 1976 (replacement to an old bridge), is 1,500 feet long and 486 feet above the river. I love exploring these cool places right in our home state! This year’s Record Store Day landed on last Saturday, April 13th! We picked up an Audio-Technica turntable when a local business was going out of sale a couple of years ago and have been slowly building up our vinyl record collection ever since. I always take Record Store Day as an opportunity to add more records, mostly because there’s usually a couple of exclusive release I want. Plus, my list of favorite records to eventually buy keeps growing every time a new record I love is released! This year, I picked up Imagine Dragons’ newest release, Origins, and Chvrches’ latest release, Love Is Dead. As usual, both sound incredible on vinyl! (I’ve been listening to these albums on Amazon Music pretty much every day for weeks now haha.) The one exclusive release I had my eyes on was a record of two Spotify singles by Kelsea Ballerini. It unfortunately had sold out by the time we got there, so I’m guessing they only got a couple in. Luckily, they were able to get me a copy, which I picked up today! Woohoo! Gotta love the local record stores. ;) Are you a vinyl record collector/listener? Growing up, I pictured that my life would go according to the "perfect" plan: I'd graduate high school, go to college (I don't remember thinking much about grad school, but once I got to high school I knew that was a strong possibility), start a career, find my partner in life, get married, and have kids. I thought that it would all happen for me in that exact order. Fast forward a good 10-20 years, and here I am: done with school after finishing my PhD two years ago, almost two years into my job, closing in on the big “dirty 30” birthday, living with my boyfriend of nearly three years, and trying to save for our future while also paying down debt and living our lives. I’ve already gotten the nudges from my parents about kids. I’m the oldest out of my siblings (besides my step-siblings), so of course I hear the most from my parents about how much they want to be grandparents. (Luckily for me, a couple of my step-siblings have had kids so my mom and step dad are already doing the grandparent thing.) It’s weird to think that at my current age, my parents had two toddlers running around. I couldn’t imagine having any kids right now! Here’s what’s keeping me from wanting to have kids, in no particular order. Kids are expensive. Between paying for prenatal care, giving birth (barring no complications), buying necessities, and childcare…it’s unreal how much is spent on kids. We have a decent household income but it still doesn’t seem like we make enough to stay debt-free and also have kids. (We’re not debt-free now but working on paying off our student loans and cars.) I’d also love to be in a position financially for one of us to not have to work. I don’t have maternity leave. Since the U.S. is so great, there is no guaranteed maternity or paternity leave (/sarcasm). The only way I can be on maternity leave and get paid is to save up all of my sick and vacation leave. I can take up to I think 3, possibly 6 months of unpaid leave after using my paid leave and still keep my job. I’m pretty adamant about wanting to take at least a year off which would require quitting my current job, unless I manage to save enough time off…and that would take years at this rate. I like being able to do what I want, when I want. Spontaneous trips to watch our favorite teams or attend concerts (see: recent trips to Oregon and Washington)? Yeah, not likely to happen with a kid around. We wouldn’t be traveling as much (if at all), and we wouldn’t have as much (if any) money to spend on things we like. I don’t want to bring a life into the world we live in right now. Mostly, it’s hard to want to raise a kid here in the U.S. between the school shootings and the issues women deal with every day (see: #metoo) and the countless other issues plaguing our society. The problem is that the majority of my family is here in the U.S. and likely won’t be moving elsewhere anytime soon. Besides, there’s also the broader conversations about overpopulation and climate change. Do I want to have kids just so they can suffer from the effects of climate change? Not really. My hypothetical kids don’t deserve to inherit our world as it is right now. My thoughts are echoed in this article via Medium and this article via NPR, and I found many more when doing a quick Google search about the the declining birth rate worldwide. Is it selfish of me to not want kids? Maybe so, but it’s also my life (and Korri’s life) that’s directly affected if I get pregnant. I want to want to have kids, and right now I’m just not there. I can honestly only think of one pro to having kids: the built-in best friend factor. I think it’d be cool to have kids—if they were adults and you could hang out with them like you would other adults. It’s probably really cool to watch them grow up, but it’s the years 0-18 aspect of it all that I’m not super thrilled about. It’s weird because after growing up with siblings and helping raise my youngest brothers, I assumed I would eventually have kids. Even though I cried when my youngest brother was born because I wanted a sister, I loved having my brothers around! Of course, if I did happen to get pregnant, we would figure out how to do the parenting thing. And I’m also not totally opposed to adopting, though that comes with its own set of challenges. I’ve even thought about how we could host an exchange student. Kids are so ingrained in our society that it’s not a topic that’s talked about often besides the common, “So, when are you having kids?” question that every couple hears. I’d love to hear (read) your thoughts on the kids vs. no kids topic, whether or not you currently have kids or if you’re planning to (or not planning to) have kids! Well, I think you could call Korri and me crazy college gymnastics fans for real now. Haha! Last weekend, we decided to spontaneously hop on a plane to Portland, Oregon, and then drive an hour and a half south to Corvallis to catch the gymnastics regional competition at Oregon State University. (Regionals marks the start of the NCAA tournament. The top 36 teams are sorted into four regional sites. Play-in meets on day one narrow the field down to the “round of 32” for day two, and then it’s cut down to the “sweet 16”, who compete on day three for a spot in the “elite 8” at nationals.) Our hometown team, Boise State, ended up being seeded in the Corvallis regional, and we wanted to support them and also watch other top teams that we hadn’t seen in person before. 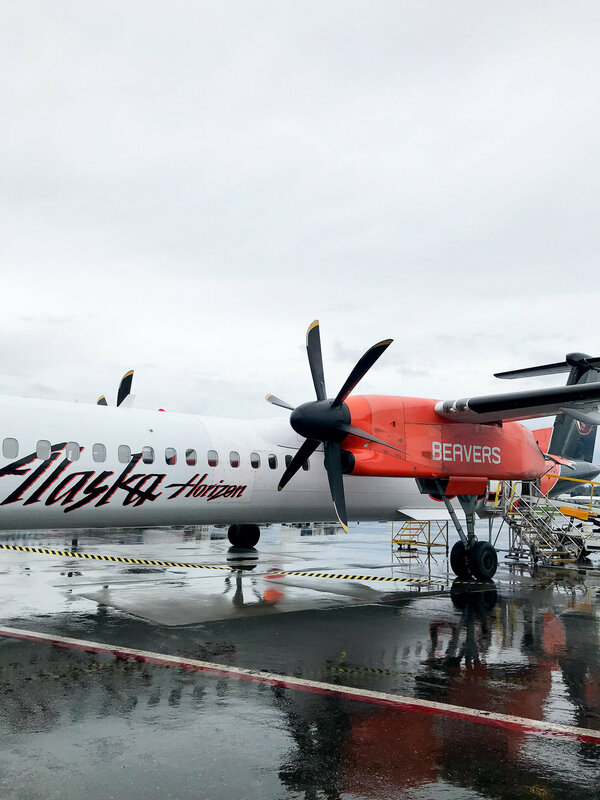 The night before our trip, as I was trying to fall asleep, I thought to myself how weird and coincidental it would be if our plane to Portland was the Oregon State plane…and lo and behold…IT WAS THE OREGON STATE PLANE! I couldn’t believe it when I saw it. I’m probably the only person who thinks that’s hilarious but that’s okay. I was very amused by our luck! We landed in Portland early on Friday, rented a car (it only cost us $55 for two days plus gas), and headed south. We stopped for a bite to eat and to walk around the Woodburn Premium Outlets, a super nice—and large—outlet mall just south of Portland. Korri bought himself a rain jacket at The North Face outlet, which was a wise decision since it ended up raining all weekend. I had brought my new rain jacket along for a test drive. After walking around the outlets, we got back on the road to continue the drive to Corvallis. Boise State’s meet started in the early afternoon. As the 12th-ranked team, they competed against No. 5 Denver, Washington, and Southern Utah. They met all three teams in regular season meets, and Denver was the only team we hadn’t seen in person. Individual gymnasts from non-qualifying teams were also at the regionals, and one of our favorites, Sophia Hyderally of Alaska, rotated with Boise State. Sophia competed on beam and I truly don’t understand how she didn’t score better than a 9.9! The evening meet consisted of No. 4 Florida, No. 15 Oregon State, Stanford, and Iowa. Three gymnasts from Utah State competed as individuals, including Madi Ward-Sessions. Madi is my favorite tumbler on floor. She is absolutely incredible to watch in person, and I loved that we were able to see her in her final meet as a senior! (Both Sophia and Madi were so close to qualifying to nationals as individuals!) I was also excited to watch Florida in person. The energy in the arena with the Oregon State fans was high, and I knew that the meet on Saturday would be intense! Florida and Oregon State advanced to day three to compete against Denver and Boise State. The top two from each regional final meet go on to compete at nationals. Corvallis is about an hour away from the Oregon Coast, so on Saturday morning, we drove out to see the ocean! We stopped first at Nye Beach in Newport. 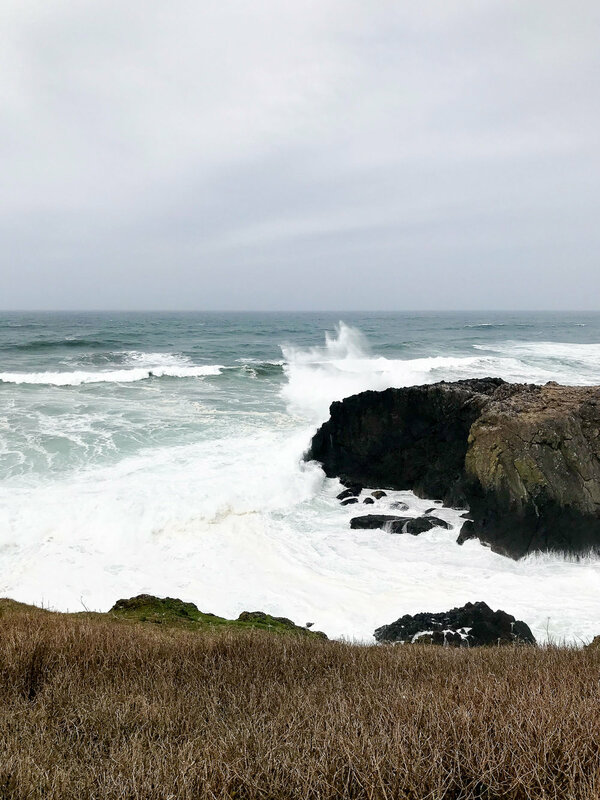 We could tell the waves were massive, and we drove north to Yaquina Head Lighthouse (officially the Yaquina Head Outstanding Natural Area) to get a better view. The visitor center noted that the seas were “moderately smooth,” which means waves up to 21 feet. Pretty sure I would never want to be on the water with 21-foot waves! Haha. 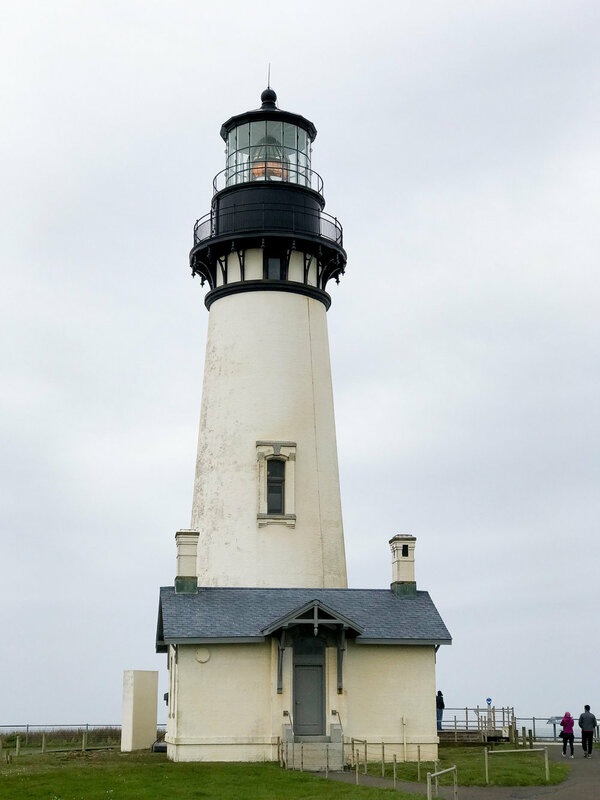 We wandered down to Cobble Beach while at Yaquina Head to get up close. There were quite a few “sneaker” waves that surprised us! I loved the sound the waves made as the water rushed over the cobbles. The geology in that area is so cool! We drove farther north past Depoe Bay to the Boiler Bay Viewpoint, where the waves were crashing like crazy against the cliffsides. We got lucky with no rain at the coast but did get sprayed with saltwater at Boiler Bay. 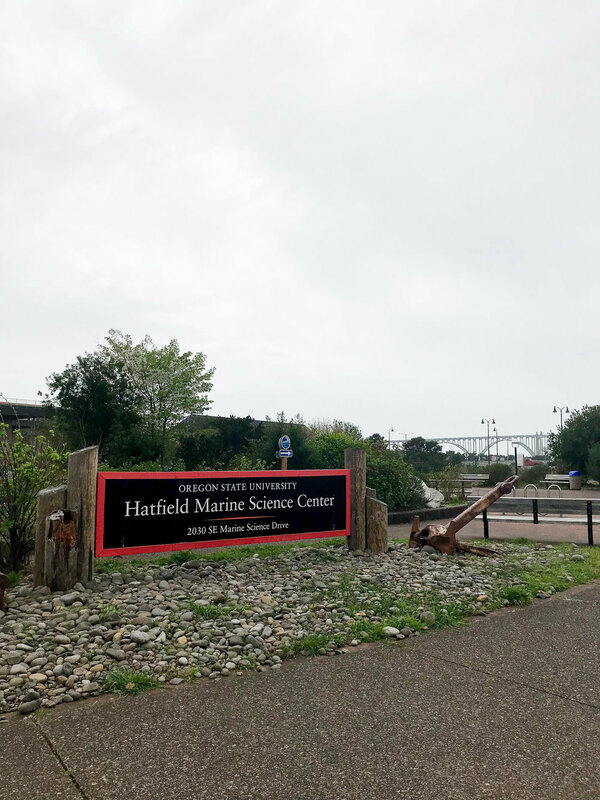 We made one more stop on our way back to Corvallis at the Hatfield Marine Science Center in Newport. It’s located close to the aquarium, and wow, what a cool place—especially if you’re into marine science! It’s perfect for kids and adults alike, and I found it to be super interesting with lots of hands-on activities. The rain joined us again when we got back to Corvallis, just in time for a baseball game! Korri heard that the Oregon State baseball team (2018 national champions) was at home over the weekend, so we made sure to catch the second game of a doubleheader. We stayed for about an hour before the rain started absolutely pouring. We left to dry off and grab pizza before the final gymnastics meet started. We headed out of Corvallis very early on Sunday morning to catch an early flight out of Portland. All in all, I am so happy we decided to jump on the plane to Portland. I love when we do random trips like this, especially when they’re tied to gymnastics and the ocean! ;) We don’t have any other trips planned as of now but hopefully that’ll change soon! Who knows, maybe we’ll do something spontaneous again soon…ha!